For those of us who write Regency-based novels, the cost of items periodically comes up. How much would would a lady’s gown cost for her Come Out? What was the cost of bread or cheese? For a better understanding of British money, see my post from Tuesday. We can make some viable assumptions on the cost of items. There are several period books that give us insight into the costs of gowns, for example. One of the MANY fabulous reasons to adore Judy Gayle’s Fashions in the Era of Jane Austen: Ackermann’s Repository of Arts is the listing of actual proprietors/dressmakers AND their addresses! It could cost a father between a hundred pounds to several hundred guineas bring his daughter out into Society. Keep in mind, this amount does not just include the gown for her formal Presentation to the Queen. It includes all the gowns worn throughout the Season. A girl would not wear the same dress to several different balls, for example. There are shoes, stocking, jewels, fan, gloves, headdress, possibly a cloak or an appropriate outer garment. The costs add up. The Court gown could usually only be worn once (like a woman’s wedding dress in the modern era), but sometimes it might be constructed to be adapted and reused. To determine the cost, one can basically look at costs for materials and then add in an extra ten or twenty percent for production. For a full Season, there would be walking dresses, morning dresses, evening gowns, riding habits, shoes, boots, half-boots, gloves, stockings, undergarments, bonnets, shawls, muffs (when in fashion), parasols (when in fashion), fans, dominos, spencers, cloaks, pellises, reticules, more jewelry, and all made to match or create an ensemble. A family would pretty much spend what they could afford. There would also be ribbons, handkerchiefs, perfumes, creams, powders, and all sorts of fribbles the young lady might wish to purchase during her Season. And then entertainments–subscriptions, theater seats, lending libraries, ices at Gunters or the cost of a dancing master or music lessons. Is it no wonder that many gentlemen bemoaned the births of daughters? The costs were often charged against the estate. Cost of gowns would depend not just on the modiste, but the materials–gold and silver netting and embroidery, expensive laces, spangles, seed pearls, velvets, etc. Then, of course, there was the actual cost of a season (a house rental if the family did not have a house in Town, the costs for holding a ball or two, servants, horses, etc, etc.) It has been estimated that a court dress could run anywhere up to £500 and even beyond. I think the lowest amount was something like £ 200. Her bride clothes could run a couple thousand. Empress Josephine’s court dress from around 1800. Jane Austen’s World tells us, “Female gowns worn at court during the Regency era looked ungainly. Instead of the lovely columnar silhouette of the Grecian-inspired draped gown, court gowns at this time made their wearers resemble the upper half of an extravagantly decorated apple or a pregnant cake topper. Dress shops would be places where a young lady could have her fittings and select fabric for the various dresses, but not purchase a ready-made dress. Linen drapers were more apt to be patronized than “dress shops” as women of this era were skilled needlewomen. As to practical things, most people of any means would have staff to bake the bread required of the household. Bread, during the period, was regulated. The size and cost was pretty much set by law. Bread cost between 3 penny and a shilling six. A 4 pound 6 oz loaf of bread ( weight) cost around 13 pence. The Corn laws were passed in 1815 because the cost of the loaf of bread went over 14d. The cost of bread fluctuated according to the price of wheat (which they called “corn” to include all grain, but not the “corn” as we think of it, meaning “corn on the cob.”) The price was higher after 1815. 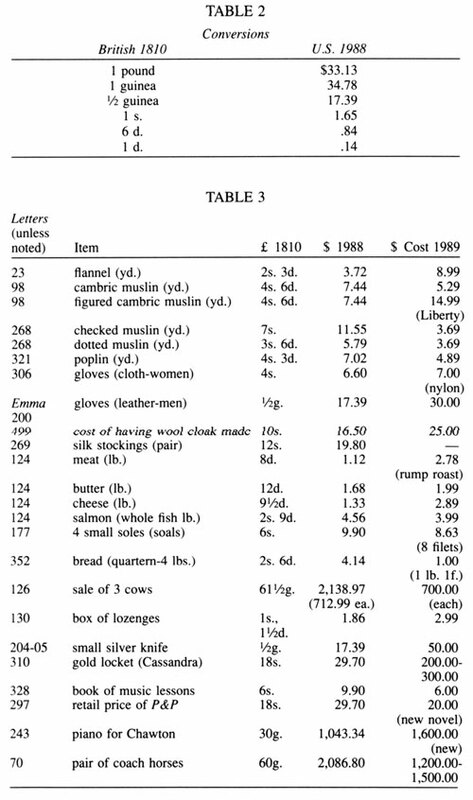 Also, the prices were higher in 1816 due to the weather. That was the year known as the “Year Without Summer.” In 1815, a pound of bread was quoted at over 4 shillings and predicted to rise to over 5 shillings. This is many times the price in 1813, but such details are difficult to find. What of the “bread” for the mind? What was the cost of books? A Minerva Press novel cost 6 shillings, but other books would be more expensive. What kind of books? A volume of an encyclopedia type book cost 3 13 6. A novel in 3 volumes cost 15 shillings. 14 shillings for 2 volumes of criticism of scripture. Another book cost 10s 6d. 2 volume set. A book Essays in Rhyme by Jane Taylor was 6 shillings. One book cost 7 £ 7 s for imperial 4 to but 10£ 10s for the same book in large paper. In the Regency, there were twenty shillings in a pound so she had 60 shillings. 240 Pence to a Pound. 20 Shillings to a Pound. 12 Pence to a Shilling. 5 Shillings was a Crown (a silver dollar sized coin in Jane Austen’s time). 4 Crowns was a Pound. Guinea (always gold) was 21 Shillings (a super pound). Guineas were replace by sovereigns ( 20 shillings) in 1817, but high end stores continued to price items in guineas. Jane Austen has some prices for inexpensive fabric but it could run up to a couple pounds an ell and the dresses needed several. In Sense & Sensibility, the Dashwood family lived on 500 pounds a year while keeping two servants. The post was from 2008, so it’s that year’s conversion amounts, when it was nearly $2/£1. A very good reference for cost of fabrics, shoes, hats , gloves and more is this invaluable book by C. Willett Cunnington: English Women’s Clothing in the Nineteenth Century: A Comprehensive Guide with 1,117 Illustrations. It is an excellent source for things such as hairstyles. The author does comment that the prices listed are those he discovered in advertisements and, therefore, were street or average prices. Fine modistes would charge much more. Project Britain also has a post on Understanding Old British Money. Also check out this page, which that describes pre-decimal sterling money. There is a quick convertor below, accurate to 2 decimal places. While this convertor gives the value in old and new money, it does not take any account of inflation. Use the National Archives currency convertor to find the equivalent buying power. think the ladies shoes will be in the same range. This entry was posted in British currency, British history, business, Georgian England, Jane Austen, Regency era and tagged British history, business, cost of living, finance, money, Regency Era. Bookmark the permalink. Brilliant Regina. This comes up periodically. Very interesting article. I am always trying to determine how much money might in a man’s purse or a woman’s reticule. Wow, this is fascinating! Thanks for sharing. I am pleased you found it useful, Anna. It’s hard to believe how much the clothes cost them in the Regency period. Thank God we don’t dress like that every day today! It is all the layers, Lori. Moreover, everything was hand made. There were not “off the rack” dresses available. Thanks Regina. I am always interested in how much all the preparations for a season would cost, but it was nice to see the food stuffs in there too since I complain every time I have to buy foodstuffs these days. Excellent as usual. However, I think you underestimated the cost of a season when a presentation gown cost probably started at 300 gns. I have seen references to 5000 for a season. I always bow to your knowledge of the period, Nancy. It is so difficult to discover such costs these days.